Sony's second budget handset in as many months - does it do enough to stand out? The Miro was always going to struggle to stand out. The budget phone market has become incredibly crowded, and even Sony itself has a couple of other handsets that aren't dramatically different. It seems like only yesterday that we were putting the Sony Xperia Tipo through its paces, but here already, with just the smallest of spec boosts, is the Sony Xperia Miro. The entry-level smartphone market is becoming increasingly crowded as it is, so it's a surprise that Sony has seen fit to release two handsets that, on paper at any rate, are incredibly similar. That it has launched them so close together is even more baffling, and surely risks rendering one of them obsolete. It's not just the Sony Xperia Tipo it's got to contend with, either. 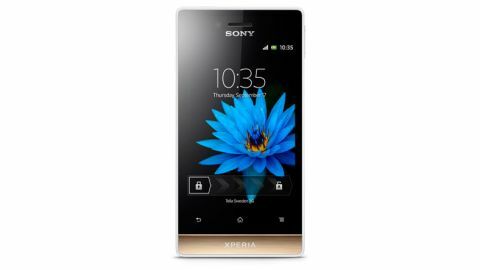 The boost in specs has brought with it a boost in price, as you can currently pick the Sony Xperia Miro up for £159/AU$240/US$239.99 SIM-free. This price range puts it in competition with the similarly styled Sony Xperia U and the HTC Wildfire S.
So, does the Sony Xperia Miro do enough to justify its price tag? Well, first impressions aren't great. The Sony Xperia Miro has a 3.5-inch 320 x 480 display, which is on the small side these days, particularly when cheaper handsets such as the Huawei Ascend G300 pack a 4-inch display. But coming from the Sony Xperia Tipo, it actually feels like quite a jump in size - it's only 0.3 inches bigger, but the difference is surprisingly noticeable. A few of its other specs have been boosted above those of the Xperia Tipo too, though they're still fairly modest. It retains an 800MHz single core processor with 512MB of RAM. Its camera sees a boost in megapixels, up to 5 megapixels, versus the Xperia Tipo's 3.15MP snapper. It can shoot VGA video at 30fps and comes with 4GB of storage, only 2.2GB of which is useable. On the plus side it supports microSD cards of up to 32GB. It comes running Android 4.0.4 Ice Cream Sandwich, which isn't the latest build but it isn't too far behind. Despite having a name that aligns it with the Tipo, the Sony Xperia Miro eschews its sibling's rounded edges in favour of a rectangular look in line with the more premium Sony Xperia U, Sony Xperia P, Sony Xperia T and Sony Xperia S.
However, if the aim was to make it seem more premium, it wasn't entirely successful. At first glance the Sony Xperia Miro does look like a better - or at least more expensive - phone than the Sony Xperia Tipo. The more angular, less chunky form factor on the Sony Xperia Miro gives it a touch of class, but as soon as you pick it up you find that looks can be deceiving. It's lightweight at 110g (0.24lbs), but with dimensions of 113 x 59.4 x 9.9mm (4.4 x 2.3 x 0.4 inches) it's not a tiny handset, and this makes it feel odd when held. Your brain tells you it shouldn't be that light, like it's an imposter, or what every phone manufacturer dreads hearing - that it's a toy. That impression isn't helped by the cheap, plasticky feel of the handset. Yes, most phones have a plastic shell of some kind, but there's a right way to do it and a wrong way to do it, and the Sony Xperia Miro most definitely does it wrong. It feels like a toy. An expensive toy, but still a toy. Below the screen you'll find three soft-touch buttons. These are the home button in the centre, the back button on the left and the menu button on the right. Below that there's a blue light that appears when you wake up the phone or when you receive a text or call. You can't even tell it's there when it's off and when it's on it looks good, extending out across much of the width of the phone. It's also incredibly useful, and we applaud Sony for supporting this feature when so few other manufacturers do. Below that the body curves inwards slightly and is adorned with the word 'Xperia'. Above the screen there's a proximity sensor, another notification light, the front camera lens and a speaker. There's a 3.5mm headphone port on the top edge, along with a small power button. Given that the power button is also used to wake and lock the handset we do wish it was a little bigger, but that's a minor issue. A volume rocker lives on the right edge and the micro USB port is on the left edge. The main camera and another speaker can be found on the back. There's a little notch at the bottom of the handset to peel the back cover off, and doing so just compounds the feeling of cheapness as the cover itself is revealed to be very thin plastic. Underneath you'll find the battery, along with the SIM card and microSD card slots. Unfortunately not only do you need to remove the back cover to swap out a microSD card, but also the battery. Granted, it's a minority of users that will need more than one card, but for those that do this is an unfortunate inconvenience. Given the tiny amount of storage on the Xperia Miro it would be nice if Sony had done more to ease expansion. Overall the Sony Xperia Miro doesn't make the most amazing first impression, seeming like little more than a Sony Xperia Tipo with a slightly bigger screen.